Buy an A4 stationery box from the selection of high-quality stationery boxes below, including Kraft and white boxes. 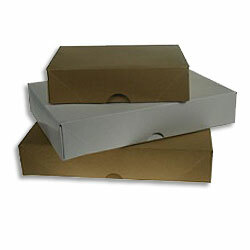 Boxes are 305 x 216 x 57mm in size and hold up to 500 sheets of A4 paper or documents. Perfect for sending out print jobs such as printed letterheads, continuation sheets, or any other A4 documents. Ideal for sending out A4 documents.